Despite the devastating consequences of World War II, Poland has managed to retain many treasures. Despite the devastating consequences of World War II, Poland has managed to retain many treasures. Its capital Warsaw has endured many an invasion and is today a confident metropolis on the rise. This memorable journey combines the capital with memorable experiences in Krakow which rates on UNESCO’s list of the 12 great historic cities of the world. A warm welcome into the Polish capital and transfer to your hotel. Follow Warsaw’s captivating history from the Gothic era to today. Start in the Old Town, with its Gothic churches and defensive walls and marvel at the fairy tale facades of the Renaissance and Baroque tenement houses. This part of the city was badly hit during the War but has been painstakingly reconstructed to its original glory. Next stop, the Royal Castle, the symbol of Polish statehood. Finish the morning at the soaring Palace of Culture and Science, one of Stalin’s “Wedding Cakes”. This building divides the residents of Warsaw, some love it, some hate it, and some try to ignore it. It is the largest building in the city centre and a reminder of the almost 45 years of Russian occupation. Take a lift up to the 30th floor for jaw-dropping views. This afternoon is at leisure. Day 3: Warsaw – Krakow. Transfer to the Warsaw railway station where you are assisted to your first-class seats. Sit back, relax and enjoy the journey south to Krakow. Uncover the beauty of Krakow today on foot. One of the oldest and most beautiful cities of Eastern Europe, Krakow was the royal capital of Poland until the 17th century and is well known for its impressive medieval architecture, and its UNESCO World Heritage listing. Visit the Royal Castle and Cathedral, located on Wawel Hill. The Cathedral is the main church of the former Cardinal Wojtyls, Archbishop of Krakow, known to the world as Pope John Paul II. The centrepiece of Krakow is the magnificent Market Square which is the largest such medieval plaza of its kind in Europe. You may also enjoy a visit to St. Mary’s Church with its famous 15th century altar by Wit Stwosz. Later a horse and carriage ride through the old town and the Kazimierz gives you a chance to sit back, relax and take it all in. Afternoon at leisure. Day 5: Design Your Day Krakow. Explore Krakow your way. 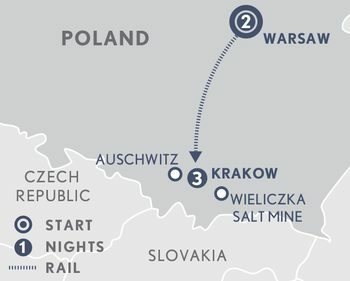 Choose between a visit to the infamous Auschwitz concentration camp, which has been preserved as a memorial for the four million people of 28 nationalities who perished here. Or take an intriguing look at the UNESCO World Heritage listed Wieliczka Salt Mines, a huge network of over 300 kilometres of tunnels and caverns with underground lakes and carved chapels. Descend 45 metres by elevator into chambers that have been carved out over the centuries and be sure to stop at the underground Chapel of St Kinga, a major highlight. Your journey concludes with a transfer to Krakow Airport.